is a feature length documentary film that will take you on a trip back to the '60s, '70s and '80s when "free form" progressive FM radio was in its heyday in America. Broadcasting from "high atop the Triangle Towers" near Washington, DC the legendary & beloved WHFS was more than just a local radio station - it was the voice of a generation. Hear from local, national and international musicians, the ‘HFS deejays, record label veterans, journalists, historians, fans and more as they reflect on a time when the music united a tribe who spoke out via the radio waves about war, equality and a time of great social, cultural and political upheaval. Want to see this film on the BIG SCREEN? JOIN OUR Feast Your Ears TRIBE! 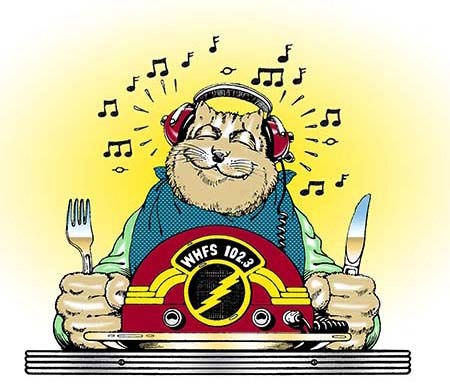 Get the latest news about benefit concerts, contests, and events where you can meet DJs Weasel, Cerphe, Damian and the Feast Your Ears production team. Help us create a buzz about the film! All Finishing Fund Contributions Welcome! Click the Big Yellow Button Below!